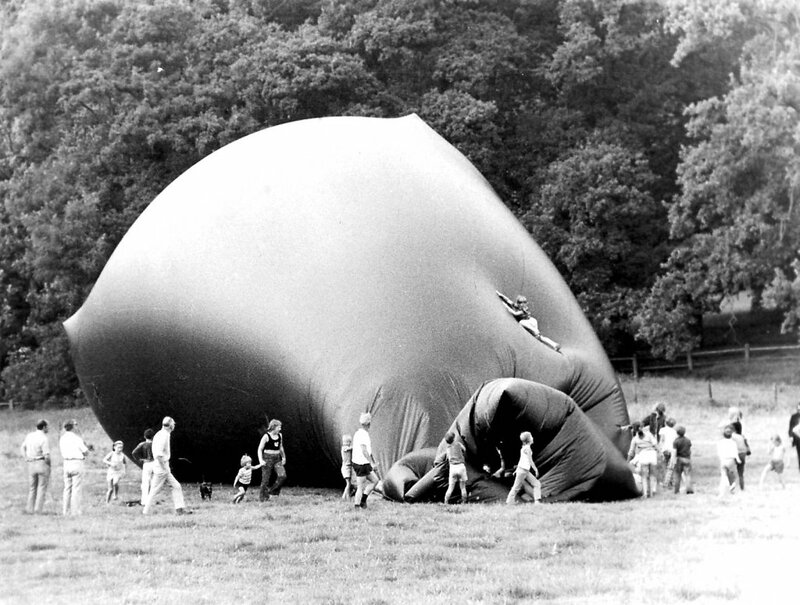 At the Sonsbeek exhibition “Beyond lawn and order”, Ronald Bladen presented a big, plywood wedge-sculpture. 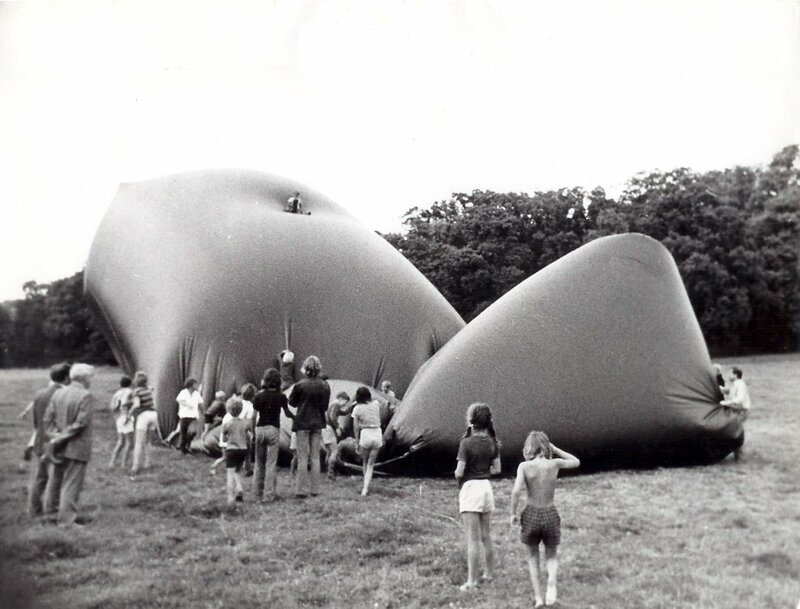 Eventstructure Research Group provided a plastic inflatable replica as a playstructure. 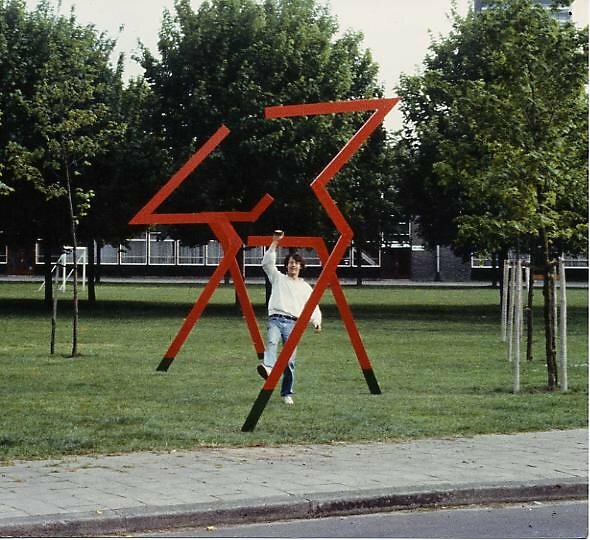 Arnhem, Holland. 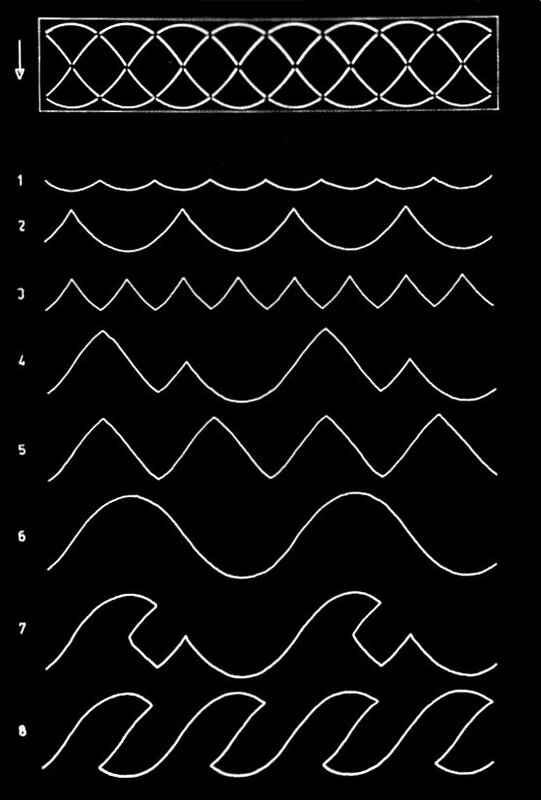 Showing the wave patterns animated by low windspeed (1) to storm (8). Wind direction controls animation from left to right or vice versa. 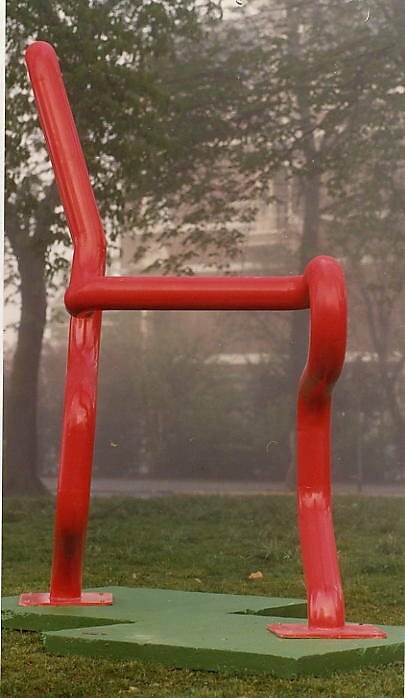 Side view of two different, characteristic chair models combined in one sculpture. Groningen, Holland. 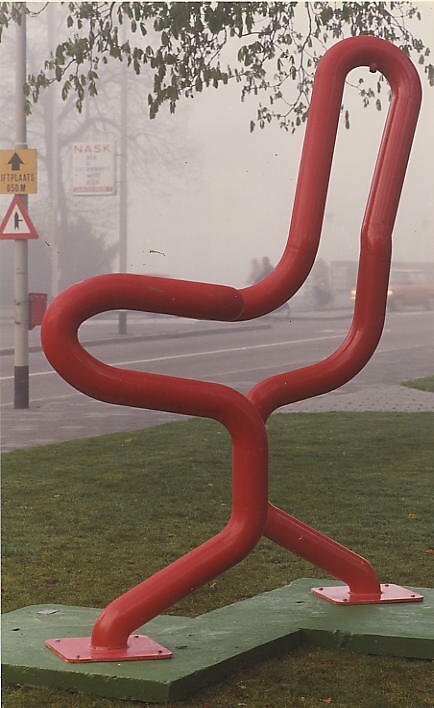 Two different characteristic chair models combined in one sculpture. Groningen, Holland. 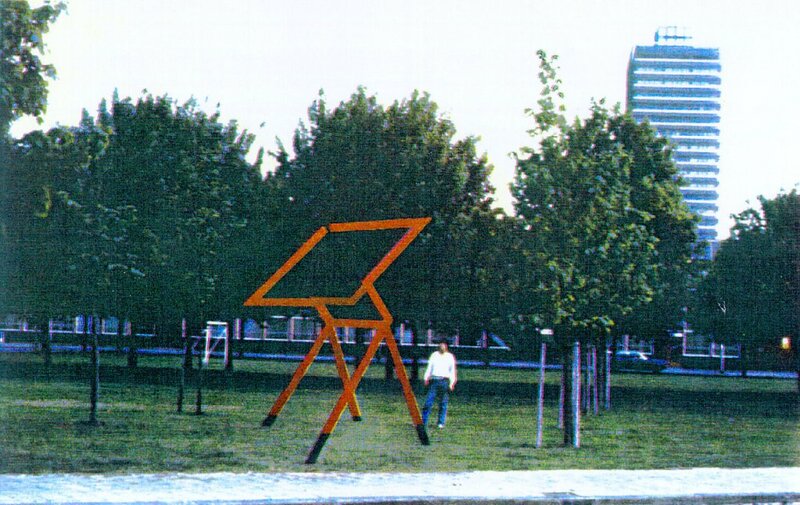 Frontal view of two different characteristic chair models combined in one sculpture. Groningen, Holland. 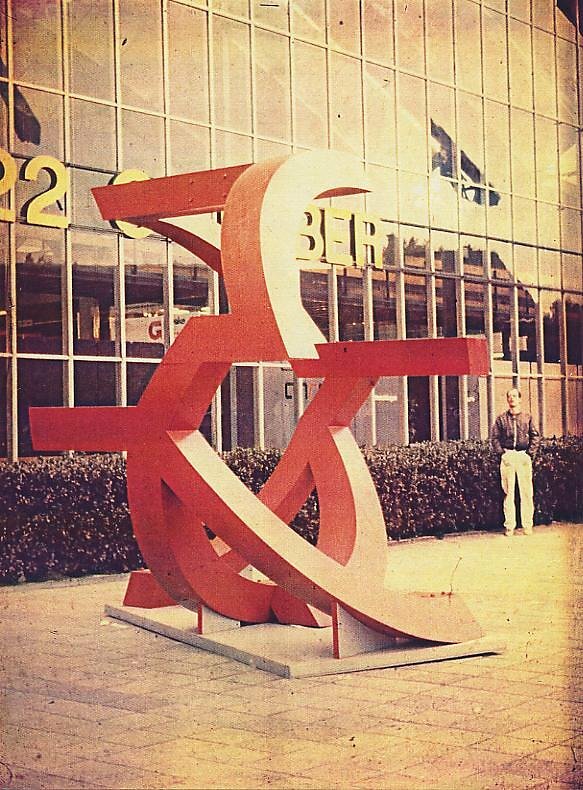 Side view of a sculpture combining a circle and an architects drawing board, the “Cirkel” being the name of the manufacturor of this and other office furniture. Efficiency fair, RAI, Amsterdam, Holland. 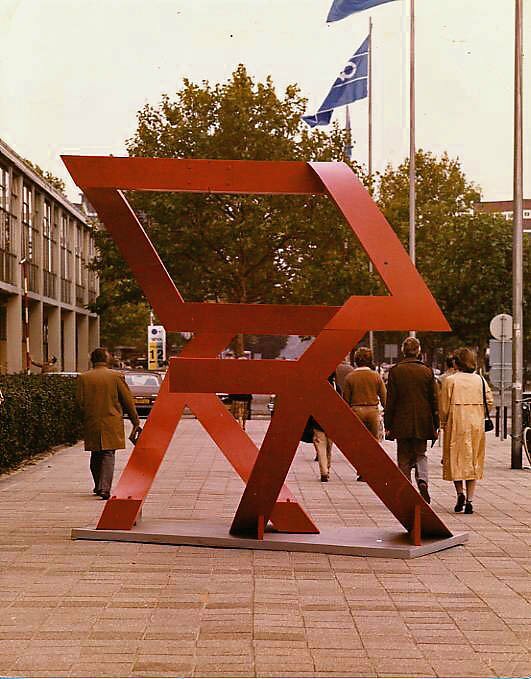 3/4 view of a sculpture combining a circle and an architects drawing board, the “Cirkel” being the name of the manufacturor of this and other office furniture. Efficiency fair, RAI, Amsterdam, Holland. 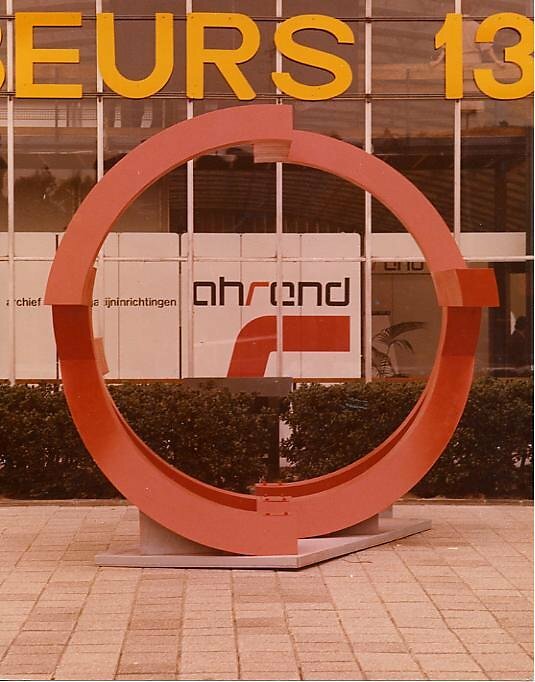 Frontal view of a sculpture combining a circle and an architects drawing board, “Ahrend – de Cirkel” being the name of the manufacturor of this and other office furniture. Efficiency fair, RAI, Amsterdam, Holland. 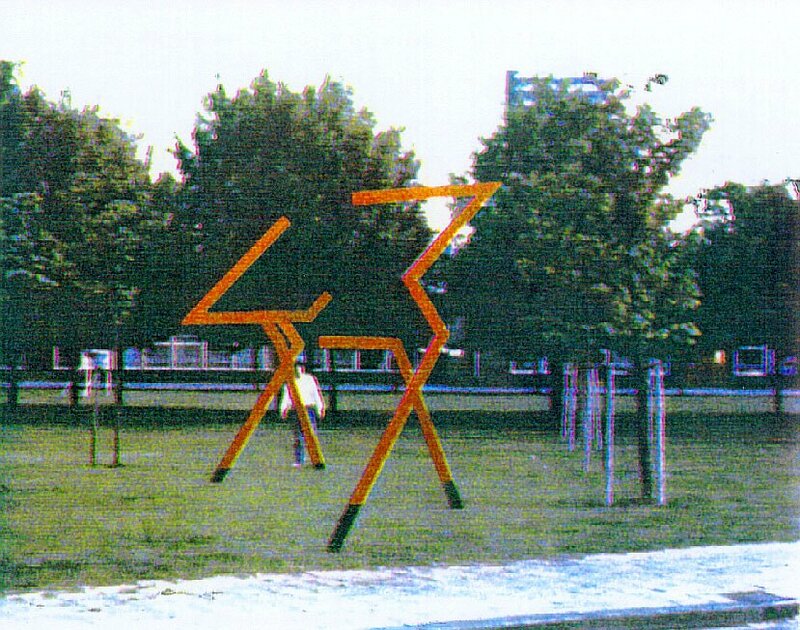 Sculpture consisting of four poles spaced out over 40 meters combining into the silhouet of an architects drawing table as produced by “Ahrend de Cirkel”. The combined image appears excactly at the entrance of the company building. Utrecht, Holland. 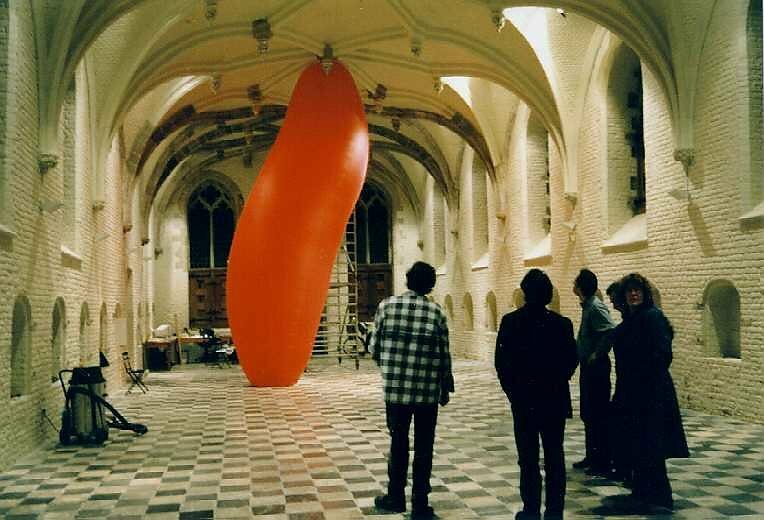 With Wick van Rij. 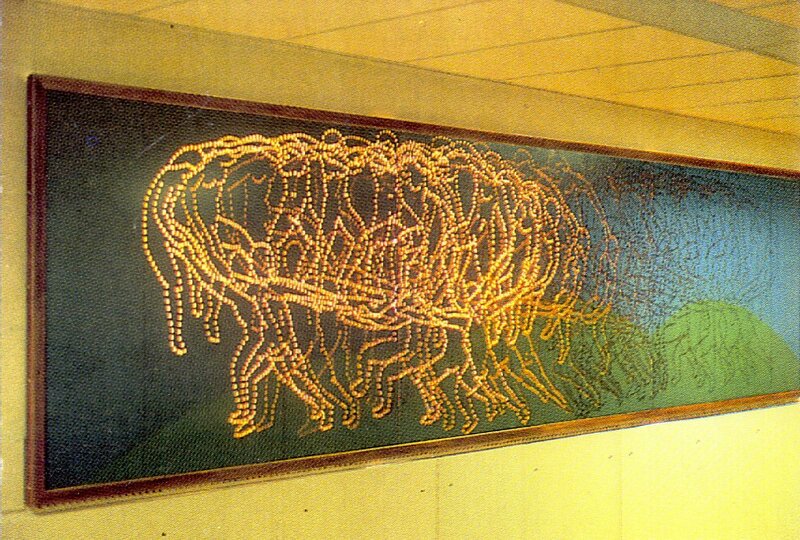 Back-lit mural consisting of a 4” substrate perforated with a pattern of holes drilled under varying angles. As a spectator passes this ‘perfogramme’ a apparent animation appears of five female figures involved in a healing dance. 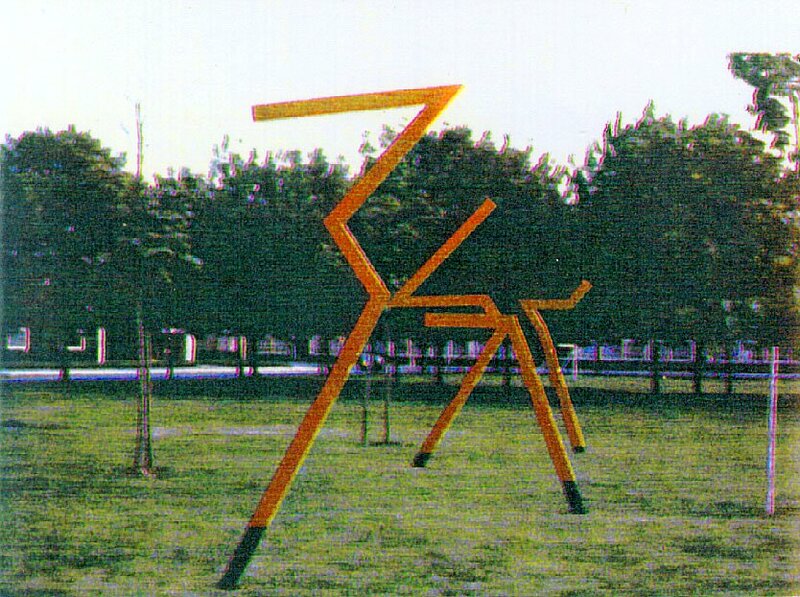 The various transitions of body outlines were derived from Matisse’s painting “Le Danse”. A.Z.U. 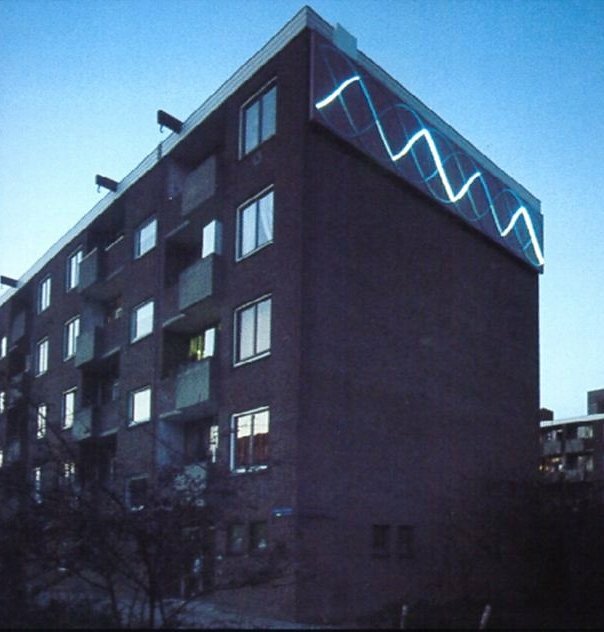 hospital, Utrecht, Holland. 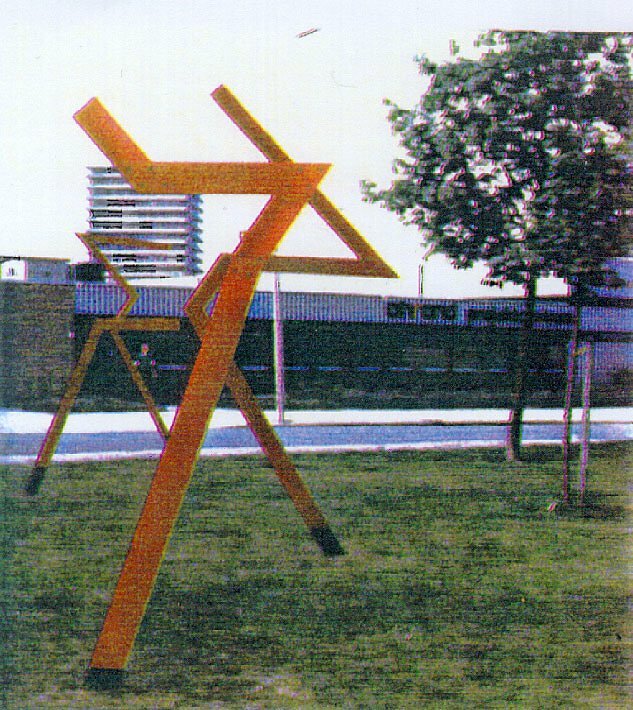 Part of an installion by Berend Strik. 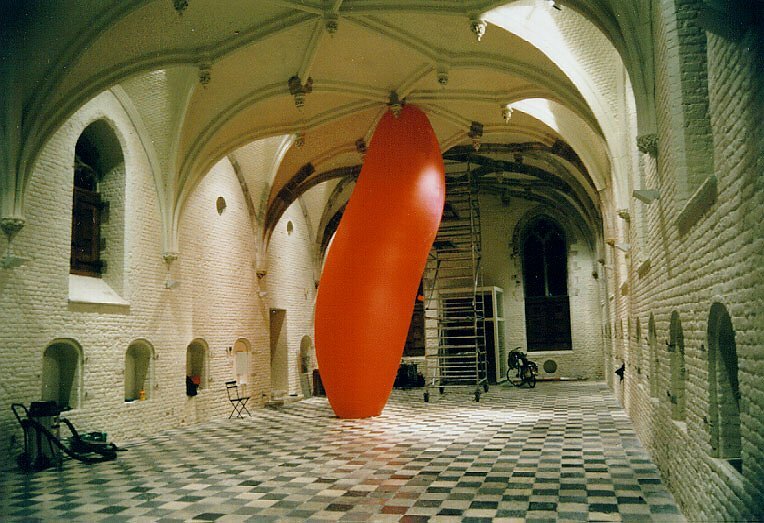 Vleeshal, Middelburg, Holland.